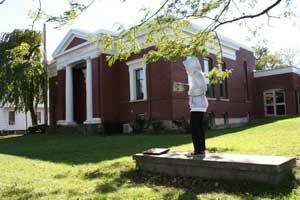 The official blog for Penn Yan Public Library’s Youth Services Department! Due to popular demand, we are sharing some recipes for DIY Cleaning Supplies. These recipes were collected from our staff, who use them in their own homes. Please use prudence and care when making and using these cleaning products. Add ¼ cup of baking soda, stir in just enough water to make a paste. Store in a dark glass jar. Mix in a spray bottle and fill to top with tepid water. Gently shake to mix. Spray, wipe and allow to dry. Mix soda & soap to make a paste. Add oils. Store in an air tight container. Fill 1 quart spray bottle. Wipe windows with a clean lint free towel or newspapers. Combine in spray bottle, shake well. Using old wash cloths or fabric scraps; pour half of mixture over cloths, then flip over and pour on the other half. Once used, throw in the washing machine. Mix together, sprinkle on carpet, let set for 1 hour, then vacuum. Mix well, store in airtight container. Sprinkle on carpet, let set 1 hour, then vacuum. Sprinkle stain with baking soda, let sit for 10 minutes, then vacuum. Next: mix 1 TBSP Dawn dish detergent, 1 TBSP white vinegar, and 2 cups warm water. Sponge this mixture onto stain and blot with a dry cloth. Combine all in a spray bottle and shake well. Spray on toilet surfaces and wipe clean. To clean the bowl, just use white vinegar. Equal parts Dawn dish detergent and white vinegar, mixed well. Use with a scrubbing sponge on tubs, sinks, shower walls and shower doors. On May 2, the Youth Services Department hosted an eye-opening visit from Laurie Gifford Adams and Scott Driscoll, the authors of www.R U in danger.net, a guide to helping keep families safe when using technology and the internet. Check out their book’s website, linked above, and Scott’s website, Internet Safety Concepts, for more information you can use right away. You can also download our tip sheet by clicking here. As always, if you have any questions, feel free to contact the library at 315-536-6114, stopping by, or emailing info@pypl.org. Kids in Penn Yan will be going back to school in just one week! The Common Core Standards are coming to New York State public schools, and this will mean changes for kids and adults. One of the changes is an increased emphasis on reading non-fiction. The Common Core Standards recommend that children read as much non-fiction as they do fiction. You can find a very clear explanation of the kinds of changes the Common Core Standards will bring in this PDF from engageNY. In the Youth Services department, we’ve put up a display to help highlight some of our non-fiction collection. Because of space restrictions in the library, our juvenile non-fiction is interfiled (mixed in) with the adult non-fiction in the lower level of the library, which can make browsing it difficult for younger patrons. With this display, we hope to show off some of the wonderful juvenile non-fiction in our collection. 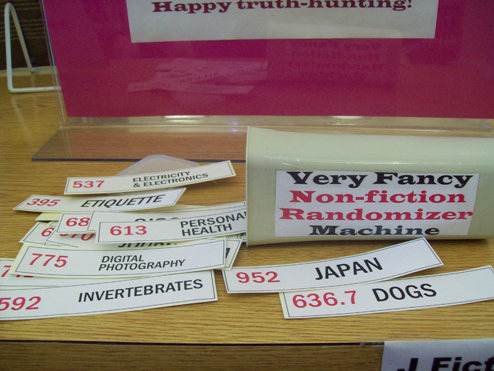 This display also includes a “Very Fancy Non-fiction Randomizer Machine” to help people dive into the collection. If you’re not sure what kind of subject you want to read about, give the Randomizer a shake, take off the lid, and pull out a slip. The slip will have a Dewey Decimal number on it, and the subject associated with that call number. 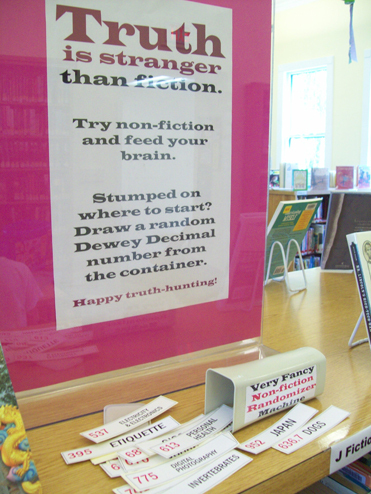 Once you have a subject you’re interested in, you can find that call number down in the non-fiction section of the library. Browsing call numbers near the one you’re interested in is a great way to discover books about related topics, too. The Dewey Decimal system is a system that many libraries, including Penn Yan Public Library, use to organize their books and other materials. It was invented by a man from upstate New York, Melvil Dewey, who also invented a system of simplified spelling, which was never as popular as his system for organizing books. To learn more about the Dewey Decimal system, ask your librarian, or check out this blog from OCLC, the owners of the Dewey Decimal system.